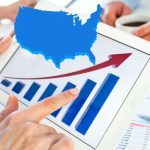 Home / All About Dental Disorders / Can You Straighten Teeth Without Braces? Dental braces help align your teeth and position them to fit a person’s jaw. They also help improve your dental health and can prevent underlying jaw issues such as joint or muscle pain or even headaches. 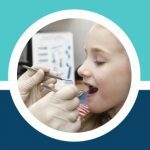 Braces can help correct underbites, overbites, crooked teeth, and other dental alignment issues. 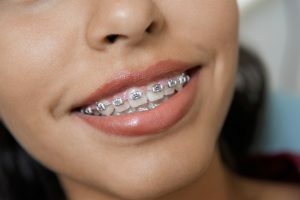 There are many different types of braces that dentists and orthodontists recommend based on a patient’s needs and the severity of the alignment or crookedness of their teeth. Traditional braces are made of stainless steel metal brackets which are attached to your teeth with glue. A thin metal wire called an archwire connects the metal brackets and puts continuous pressure on a person’s teeth, which helps move the teeth into correct positioning over a period of time. 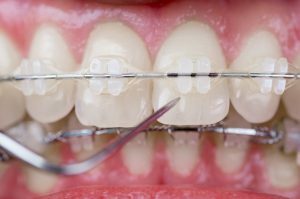 Ligature elastics, also called rubber bands, hold the archwire into place on the brackets and are changed at each appointment. Braces apply pressure over a period of time on your teeth to force them to move in a particular direction, eventually changing the shape of the bone with the pressure. Your dentist or orthodontist will examine your teeth to determine the best course of treatment to take. Braces can correct many problems. Not only can they improve your smile, but they can also help maintain your oral hygiene and help prevent the risk of cavities or gum disease. This is because crooked or crowded teeth can make oral hygiene difficult and improper bites can result in damage and wearing away of tooth enamel. 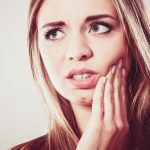 Dental problems resulting from crooked teeth, overcrowding or over/underbite can make speaking and chewing difficult and can also cause unnecessary stress on the tissues and bones around your jaw, mouth, and teeth. Traditional braces are made of stainless steel with metal brackets. Each metal bracket is attached to a tooth and is linked together with an archwire. The archwire applies pressure to a person’s teeth forcing them to move into position. The archwires are connected with elastic. Ceramic braces are similar to traditional braces except that the brackets on ceramic braces are clear and transparent, making the braces much less visible to the naked eye. Ceramic braces are often a popular choice for adults seeking orthodontic treatment because they are less visible. Damon braces have a slide-mechanism to connect archwires and require fewer visits to the orthodontist. Damon braces are self-ligating and can straighten teeth much faster than traditional braces as they do not need to be adjusted. Damon braces also put less pressure on your teeth, making movement much less painful. Damon braces are also much easier to maintain and keep clean than traditional braces and are becoming a more popular choice because fewer visits to the dentist or orthodontist means that they will be spending less money and time on taking trips, making it an ideal choice. Invisalign is a custom-made, clear aligner which aligns your teeth similar to mouthguards. You can remove them when you are eating and swap them out for a new one every few weeks. They are also recommended for use after your orthodontic treatment has been completed, helping maintain your smile as your teeth are still settling in. Many people avoid going to the orthodontist because they don’t want braces. This is because braces can be uncomfortable, embarrassing and not very appealing. If you have crooked teeth and are wondering if you can straighten your smile without having to get braces, there are a few options you can consider. Invisalign is a great alternative to braces. They can straighten your teen over a period of 18 to 24 months. 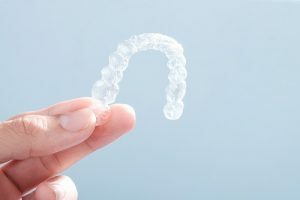 If you use Invisalign, you have the comfort and convenience of knowing that you can take out the aligner when you want to eat or brush your teeth. Invisalign can improve overcrowding, overbite, underbite, and teeth spacing and is quite possibly the easiest way you can straighten your teeth without braces. Minor overcrowding: if your teeth are simply overcrowding and are only slightly crooked, you can straighten your teeth using Invisalign. After Invisalign has straightened your teeth, you can use a fixed retainer which will hold your teeth in place. Fixed retainers are attached to your inner teeth and prevent any future shifting. Fixed retainers are invisible, which makes them a great option for anyone who does not want braces simply for aesthetic purposes. Bite misalignment: if you have a misaligned bite, also known as malocclusion, a retainer can help realign it. If you have crooked upper teeth, you may have a narrow upper jaw. This can be fixed with expanders which allow your teeth to move into position by creating space along your upper jaw for them to move. Expanders are attached to your upper molars and are completely invisible. The only time you may experience pain or discomfort with an expander is when they are adjusted. You can also use lingual braces, which are braces which are placed on the insides of your teeth and are not as visible as regular braces. Each option is different and the one you choose will depend on how the structure of your teeth and the severity of their condition. If you have severely crooked teeth, you may have no choice but to choose regular braces. If you have crooked teeth and want to straighten your smile but do not like the way metal braces look and are looking for other options, consult with your dentist or orthodontist to go over your options. 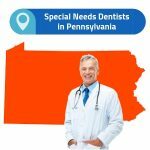 Depending on the severity of your crookedness and your teeth structure, there might be an option for you which doesn’t require having to put unappealing braces on your teeth.